Ambergris Caye is the largest northern island of Belize, and accounts for much of the country's tourism due to its natural beauty and attractions like scuba diving the barrier reef or exploring the Mayan ruins. As tourism has increased over the last few decades, Belize has continually invested in infrastructure on Ambergris Caye, providing modern convenience among natural beauty, an important factor for both tourists and those looking to relocate to the island. 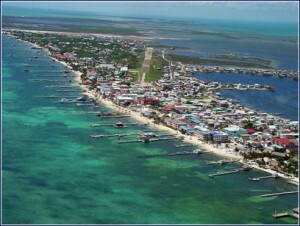 San Pedro is the largest city on Ambergris Caye and maintains a small airport for travelers flying to the island. Most flights leave the Philip Goldson International Airport just north of Belize City with flights lasting approximately 20 minutes. The planes used for travel to the island are small Cessna Caravans and Twin Engine Islanders, so be prepared for tight flights and possibly baggage restrictions due to limited storage space. Flights are only available during the day with no flights taking off or landing during darkness. Beyond air transport, those traveling to Ambergris rely on a series of boats and boat taxis to get to the Caye as well as navigate around the island. Ferry boats provide regularly-scheduled and affordable travel as well as other water taxi services from docks throughout the islands. Taxis consist of open speed boats with outboard motors. These transport vehicles are also the easiest way to reach popular scuba dive areas. For those relocating to Ambergris Caye, boats are typically the best way to transport your belongings to the island. Ambergris Caye is served by a road system that varies significantly in quality, depending on where you're traveling. Three main north-south streets run through the island with roads that interconnect and branch off of them. While some roads are cobblestone, many are not. As such, rain on the island can make roads nearly impossible to navigate. Luckily, most hotels offer bikes for free or to rent or are located within a short distance of bike rental shops. Bikes more easily handle dirt roads and other areas that are difficult for cars or golf carts. Many areas, especially when navigating San Pedro, are also accessible by walking. Ambergris Caye provides modern utilities including sewer, water and communications, especially in San Pedro and the surrounding areas. Both DSL and cell signals are available through local Ambergris utility providers. More rural areas may not be connected to Belize utilities providers but typically still provide modern conveniences through power generators, septic tanks and contained waste water systems. To learn more about the infrastructure in Belize, click here.